The drawing is a simpler version of Gandy's interior perspective of the same subject (see drawing ). 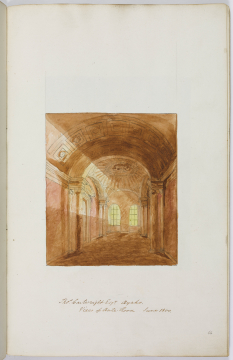 Volume 69 (of which this drawing is page 66) forms a collection of (label) ' Sketches by J. Gandy / of Buildings designed by / Sir John Soane R.A. / and from which Sketches / Fair drawings were subsequently / made between 1798 and 1800'. So clearly this was a preparatory drawing to the final drawing that took fourteen and a half days to make.